Home » Tutorials » HTML5 » Lesson 2: What is HTML? This lesson will give you a brief introduction to your new friend, HTML. Hyper is the opposite of linear. In the good old days — when a mouse was something the cat chased — computer programs ran linearly: when the program had executed one action it went to the next line and after that, the next line and so on. But HTML is different — you can go wherever you want, whenever you want. 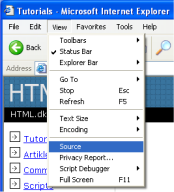 For example, it is not necessary to visit MSN.com before you visit HTML.net.